Last Thursday, school was out for both my child (one attends school and one is homeschooled). Instead of booking a summer full of camps, lessons, and travel, I believe firmly in leaving expansive times of freedom to allow what will happen naturally when children are allowed to fill their days. One reason I dislike homework is that my children are left with little time to just be during the school week. I don’t think is healthy at any age to not have free time, including adults, but it is especially concerning for children. Play is an important part of development. Self-directed activities don’t happen naturally without time. Boredom leads to creativity. Homework takes away from all of this. My thoughts on homework have evolved greatly since my full time teaching days. As a teacher, I assigned too much homework. I admit it. It was an easy way to have children finish up lessons not completed during the day. I felt obligated to assign homework. It was part of the job. As a parent, I have already explained why I feel homework contributes to play deficit disorder. If you are lucky, a teacher or school will respond to your concerns about homework. If not, then you can turn to a resource like Homework: A Parent’s Guide To Helping Out Without Freaking Out! for help. What do I say when my child says “I don’t care” about school? Right away, I don’t like how the word “punish” is included in the book description. I believe more in natural consequences for discipline. As a teacher, I would have children stay in at recess to complete homework assignments. Yes, children need recess, but I also presented it as a choice. The student was choosing when to do their homework: at home or at school. I believe in empowering children, not punishing. 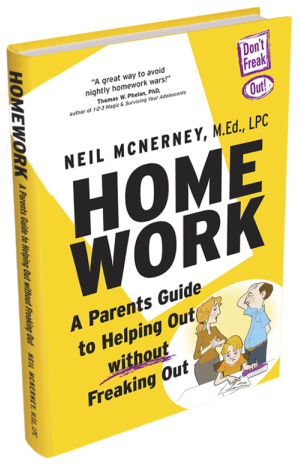 To be fair, author Neil McNerney, M.Ed, LPC, does say to focus more on rewards than punishment, as punishment doesn’t work well for the disorganized child. Furthermore, he also emphasizes choice as a way to relinquish power and avoid a “battle of wills”. If you are facing difficult homework issues, this book could be helpful. For some children, the difficulties actually lie in the inappropriateness of the actual assignments. Perhaps they are too hard or too easy, thus the child is not really benefiting from this additional work. Consult your child’s teacher, and together perhaps you can find a more appropriate and authentic home to school experience. My teammates and I feel the same way about homework – but we are required to give it by district policy. Please remember that most teachers don’t set homework policy that is done at the building or district level. 1. Student receive the whole week’s homework on Mondays. That way parents and students (2nd grade) can organize their time to finish it. 2. It is material the students have already mastered, to help maintain skills or is designed to help students learn how to study. 3. Generally it is a spelling list, a short reading passage with questions, a review previously taught math concepts, and some type of science or social studies activity. 4. Students are only rewarded for turning it in, not punished not completing it.